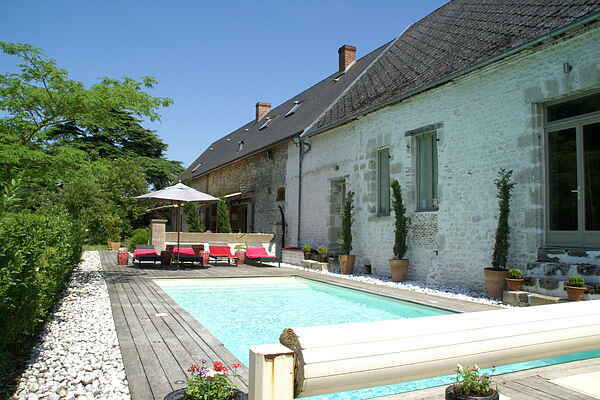 Fantastically restored holiday home with pool on 2 hectares of grounds in the town of Saint Péravy-la-Colombe. The house has a contemporary interior while preserving some authentic elements. In the living room a beautiful wooden floor, open fireplace and large dining table. Upstairs there's a children's playroom with table tennis and various other games. The property consists of a comfortable holiday home, a few barns and the office of the discreet owners. There is a huge garden behind the house with terrace and WEBER BBQ. There is a pond in the garden, so be careful with the little ones! Children have plenty of space to play or to take a dip in the pool. There are four mountain bikes and four children's bikes at your disposal. Bakery in St. Péravy-la-Colombe (300 m). Large supermarket in Patay (5 km). In Orléans (20 km) allow yourself to indulge the taste buds in one of the many restaurants. The medieval streets have several shops. The large Gothic cathedral of Sainte Croix is beautiful both inside and out. A little further away is the city of Chartres (55 km) with its historic centre with an impressive cathedral included on the UNESCO list.